Presently there is very little to be found on the web about BTI in general, and the BTI 8000 specifically. The BTI story should be documented, rather than letting this bit of history evaporate without leaving any trace. The website is an attempt by someone with only a tiny sliver of insight into BTI's history to preserve some of it. Because of the lack of source materials and of first hand information, this site is bound to be rife with errors of both omission and commission. It is starting modestly, and growing organically. At this point, this website is mostly a honey-pot, hoping to connect with people who have more of the BTI story, manuals, and software, that might be shared. As I gather more information, it will be posted here. Please help if you can. In 1968, Tom Poulter was a long-time HP engineer and product manager, and had just introduced the HP 2000A timesharing system. On the heels of that success, he left HP to found Basic Timesharing Inc. as a commercial timesharing service. Tom was joined by fellow HP-ers, Steve Porter and Paul Schmidt. After getting initial operations going, Tom and Steve started reworking the 2000A code, adding more advanced features and making it more reliable. Interestingly, HP provided the source code to its customers; their view was they were selling hardware, and the software was just an inducement. Paul Schmidt, meanwhile, went about selling their timesharing service, which went for about $5/hour. Users logged into BTI's compute resources and run jobs remotely, via TYMNET. 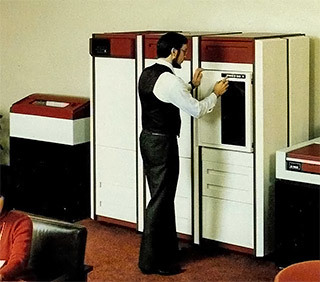 As business expanded, BTI needed to add more disk storage, but HP's fixed head drives were terribly expensive. Steve Porter designed a disk controller to interface to an Iomega 2.5 MB drive, at a price much less than what HP was charging. Eventually it became apparent that selling timesharing services was not nearly as profitable as selling the hardware for timesharing services. BTI started selling turn-key systems for auto dealerships in 1971, and Basic Timesharing Inc. was renamed BTI Computer Systems. The following history comes from Ron Crandall. The first [customer for BTI hardware] was Arne Cantrell who wanted to make software for automobile dealers. John Matthews (of Matthews Chevrolet in Tuscon, AZ) was willing to foot the bill for the hardware and software development. So, Poulter and Porter bought the needed hardware and did a lot of software work to productize the stuff they had been working on. That system was delivered sometime in 1971 and was the first BTI 3000, not counting the one in house for the timesharing service. More 3000s were sold over the next year or two. I hired on at BTI in Jan 1973 and continued to work on the software for a few years before the 8000 development got underway. Reynolds and Reynolds bought the automobile dealer business from Arne Cantrell. They wanted cost reduced versions of the machine. So, the BTI 4000 was born. It had more parts of BTI manufacture, it was more modular so that it didn't require a relay rack any more. It was made of sheet metal modules that stacked to form the system tower. Each module could be boxed and shipped easily and the installation was much quicker and easier. We shipped probably a thousand of these. The 5000 was when we built everything ourselves, including the CPU. I'm not sure where the memory came from. We probably shipped about 2000 of these. Both the BTI 3000 and 4000 used HPs switching power supply, which proved to be unreliable. Although service calls were all too common, it was typical for the era. This problem was fixed on the BTI 5000, which used a low-tech, but reliable, linear power supply. BTI added value with their hardware changes, but even more with their changes to the standard HP 2000 software. Starting with the same BASIC dialect as the HP 2000A, BTI enhanced it to make it more useful for businesses. For instance, rather than the 32b binary floating point format, good to six decimal digits, BTI's BASIC-X dialect switched to 64b BCD floating point, allowed for more simultaneously open files, and a larger memory space per user. Eventually, BTI rewrote key sections of the interpreter in the CPU's microcode, greatly speeding up system throughput. After this, a BTI 5000 could handle six+ interactive users comfortably. Since its first deliveries in 1971, BTI has delivered over 700 Model 3000, 4000, and 5000 series systems, with installations in over 40 states in the U.S., in Canada, and in Europe. These systems are used in a variety of applications, including general accounting, inventory-control, time-sharing services, product testing, research and development, medical laboratories, health care systems, and school administration. The new BTI 8000 system is a planned outgrowth of BTI's special experience in the design, manufacture, and support of multi-user interactive computer systems. However, there are some very different sales figures, also sourced from BTI. A brochure from late 1978 mentions that 2500 BTI 3000's, 4000's, and 5000's had been sold. A June, 1984, Tymnet document states that as of June 1, 1984, BTI had sold 4000 medium-scale interactive timesharing systems. Our contract with R&R [Reynolds & Reynolds] called for manufacture of BTI 5000s, at the peak we were building a little more than 140 a month. They got a discount price depending on how many were released to be built. They also had a provision that they had to 'release' (ahead of time by a few months, I'm not sure how long) for production some number of machines. They were only allowed to change that number from month to month by some percentage (about 20%, but I don't know the details). We held completed machines that R&R had not yet sold, so we could see how they were doing. When they sent us an address, we shipped the machine. In summer 1980, R&R noticed that they were starting to build up a little inventory of unsold machines. So, they instigated a sales contest to try to move them. Now, apparently, the incentives were pretty impressive, and the sales force started to really move machines. So, we got releases for MORE production. Then, at the end of the sales contest, sales vanished... every customer who had any thought of buying one had been tapped. But, meanwhile, we are building 140 systems a month. R&R is now reducing their releases at the highest rate allowed in the contract (0.8 times 0.8 times 0.8 etc.) So at some point the new orders from R&R go to zero and we have 750 systems sitting in inventory. Worse, the 8000 is about to enter production and we had high hopes for lots of sales, so were really slow to lay off our experienced manufacturing employees. This culminated in a massive layoff in January 1982, which was followed by lots of desertions as scared people made a move. We had two more minor layoffs that year. Keep in mind that much of BTI's revenue wasn't just the sales of new computers. System upgrades (more memory, more and larger disk drives, printers) was important, and maintenance contracts also generated a lot of revenue. Thus, even though sales had dropped off, the installed base kept the company going despite poor sales of new systems. While BTI did well selling systems on the BTI 5000 to car dealerships across the country, management boldly decided to move into the super-minicomputer This was a multi-year effort, and as the revenue from the older systems peaked and started to decline, the pressure for the 8000 to succeed mounted. The BTI 8000 had some really brilliant aspects, and some things that doomed it from the start. In short: the symmetric multiprocessing hardware and system architecture were ahead of their time; the 512 KB virtual address space became very limiting rather quickly. Please visit the BTI 8000 page to learn more. As detailed on the BTI 8000 page, sales of the 8000 never took off, while sales of the 16-bit systems dwindled. A series of contractions left BTI in the US down to about a dozen people by 1993, and finally closed up in 2002. In 1977, BTI opened an office in the UK; besides sales, they offered maintenance on things like the tape drives. In fact, they built a good business performing maintenance on other electronic equipment unrelated to the needs of what shipped with BTI systems. Even after the US side of BTI shut down, the UK operation continued on, and is still going, providing computer room monitoring systems. Please contact me if you have any BTI brochures, manuals, media, or even just a story to share. I'm more than happy to pay shipping for anything you are willing to donate.